You need not leave Paris this summer in search of sunny beaches, on the 20th July the beach will come to you! 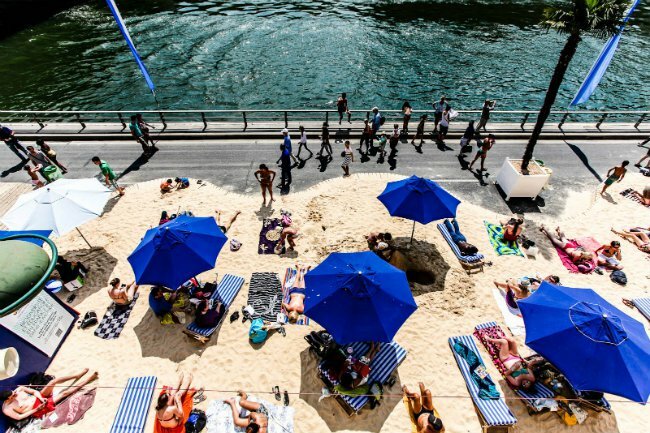 As part of Paris Plages, three beaches located along the Seine river (and the Bassin de la Villette) will feature traditional beach holiday essentials; gloriously sandy beaches crafted with 5000 tons of sand, brightly striped deck chairs, ice-cream sellers and concerts to be enjoyed by locals and visitors. 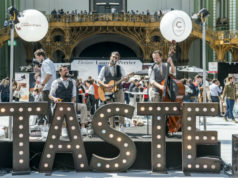 A hugely popular annual event, Paris Plages is back for its 14th edition. 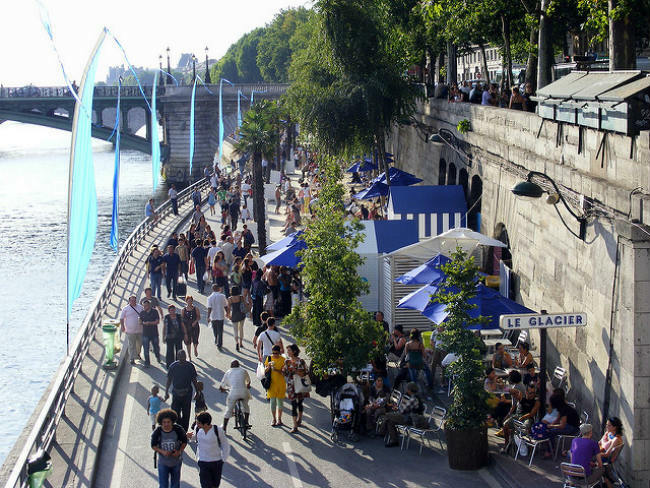 Visitors will see the capital in a new light; the usually frantic thoroughfares which line the Seine will be car-free, leaving the crowds to enjoy summer’s splendid greenery across three locations; Voie George Pompidou, Place de la Hotel de Ville, and Bassin de la Villette. Located at the Voie George Pompidou, the beach hosts a large range of summer activities: Tai Chi classes will take place daily at 10-12am; Zumba, Tropical and Latino dance classes will run through the summer with the theme “guinguette” Monday to Saturday from 5pm to 8pm; kids afternoons on Sundays 3pm to 5pm at Tunnel des Tuileries. The Louvre Museum brings the ‘Neptune’s Realm’ exhibition to the beach; daily activities will explore the mysteries of the sea and a lottery prize draw offers the chance to win tickets to the museum, daily 10am to 6.30pm (until 8pm on Wednesdays and Fridays) at Tunnel des Tuileries. 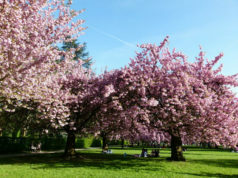 Spanning three kilometers in the heart of historical Paris, this is the perfect location to enjoy diverse open-air attractions. For three nights from the 20th-23th July, the FNAC Festival live concerts will be held on the main outdoor stage (from 5pm – 12pm), with intimate concerts taking place inside the City Hall, for program information take a look here. Outside the Hôtel de Ville, four volleyball courts are available for everyone, open everyday from 28th to August 16th 1pm to 8pm. For those who prefer to relax and take in the views, deckchairs line the ‘shore’ alongside refreshment and play areas. 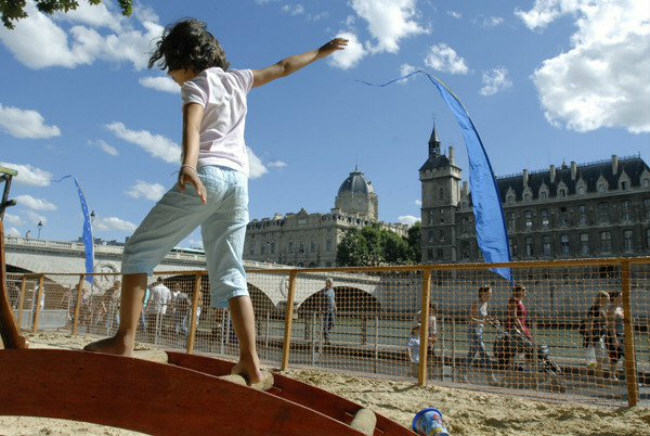 The newest addition to Paris Plages in 2007 was the beach lining the Bassin de la Vilette. Visitors can get savor a good summer read, with books available to borrow free of charge. Take advantage of the water-sports complex with rowing boats, kayaks, pedal boats and dinghies; take an aquagym class in a mini pool, or kayak around the lake at Quai de la Loire, everyday from 1pm to 8pm. Relax after water-sporting fun in the quaint quay-side restaurants and boules courts. Battle your friends in a friendly game of Foosball; tables are free to all, including the huge 5×5 table from July 20th to August 21st, daily from 1pm-8pm. The Musée National de la Marine museum will host a range of maritime themed activities for children and adults from board games to a giant battleship! From 2pm-6pm from Monday to Friday, 10am-12pm and 2pm-6pm on weekends. The full program of events can be viewed here. 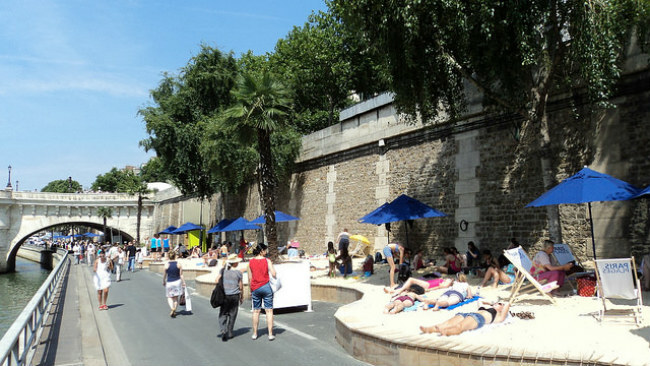 Paris Plages 2016 : from 20 July to 21 August, entry to all beaches is free and open from 9.00 am to midnight. Image Credits: DSCF3863 by Mathieu Marquer/Flickr. Paris Plages 2012, The Seine by Sharat Ganapati/Flickr. Paris Plage by ErasmusOfParis/Flickr.